Two days of conferences, workshops, and commercial promotion for Italian biotechnology companies: BIO International Convention 2011 opens today and the Italian pavilion at the most important international biotech event taking place in Washington until June 30. As explained by Foreign Trade Institute (ICE) President Umberto Vattani, “there will be 44 companies, research center and scitech parks participating in the schedule of meetings in the framework of the project to develop the biotech sector funded by the Ministry for Economic Development in collaboration with Federchimica-Assiobiotec under the Working Group coordinated by the National Commission on Biosecurity, Biotechnology and Life Sciences at the Prime Minister’s Office. white biotech (environmental and industrial). 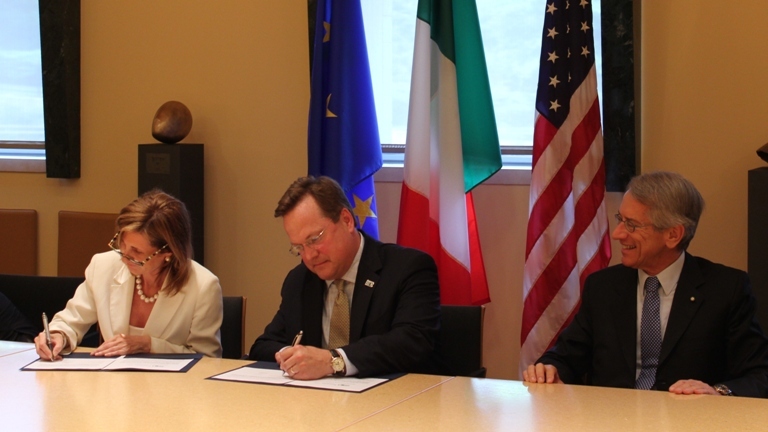 On the occasion of BIO 2011, Italy’s Assobiotech and the Pennsylvania Biotechnology Center will sign, with Ambassador of Italy to Washington Giulio Terzi in attendance, the “biobridge” agreement to promote, among other things, bilateral collaboration programs in research. As Amb. Terzi explains, “the agreement is fruit of very similar experiences” and “the billings of the 622 U.S. companies quoted on the Exchange are growing at a pace very similar to those of Italian companies” with an increase of 8% from 2009 to 2010 (from $78 to $84.6 billion). visitors from 65 countries and 49 U.S. states.